Takeaway: There are many steps from the planting of a grain of wheat, to growth, to harvest, to milling, and eventually, to that loaf of bread on our table! Copy and memorize a table grace, such as the one mentioned in the lesson or one of these at Daily Prayer. Bake a fresh loaf of bread. You’ll find resources below. Make a flowchart of the life of bread from wheat seed to loaf. You’ll find resources below. This book was published in 1927. Learn how much wheat Americans consume now, and how this compares with other countries. At the time the book was written, Americans consumed 250 loaves of bread per person each year. Do the math to figure out the current rate of consumption (assuming 250 loaves per 5 bushels of wheat). On average then, how much wheat does your family consume per year? Make black bread (Russian bread, a form of pumpernickel) and compare it to the bread we normally eat (recipe at King Arthur Flour). View a picture of a sickle. Of course, now we have combines which not only reap but also thresh the wheat harvest. And oh, how much faster we go! You can view a video below to appreciate the difference. Remember the plowmen? What is their role when it comes to making a loaf of bread? Learn the hymn referred to in the lesson, “Guide Me, O Thou Great Redeemer”. Something to do #1: You’ll find the information referred to in John 6. Something to do #2: Use the blank outline world map at EduPlace.com (World: Countries). Then consult the world wheat harvesting calendar at the Montana Department of Agriculture to make your wheat harvest calendar. You’ll find calendar helps below. Something to do #3: Consider making a digital collage. Something to do #4: Read “Back of the Loaf” by Maltbie D. Babcock. The verse can be illustrated on Drawing & Writing Paper. Copy and memorize Psalm 81:16, Psalm 147:14, or Psalm 103:1-5. Recite the verse to your family. You’ll find “Come, Ye Thankful People, Come” at NetHymnal.org. Of the food plants in the whole world wheat is king. In proportion to the nourishment it gives, few foods can compete with wheat from the standpoint of economy…. Wheat is a cereal grass. It belongs to the same family as our oats, corn, barley, millet, sorghum, rice, rye and some other food plants. Wheat is an annual, or a winter annual, with a hollow, or sometimes pithy, stem called a culm. The stem has partitions at nodes and long, narrow leaves grow from these nodes. For perhaps half its lower part each leaf is wrapped around the stem down to its own node where the leaf is attached to the stem. At this point nutrition manufactured in the leaf, passes into the plant proper. At the end of the culm the flowers appear. These develop into kernels, green at first, ripening under the summer sun. Each kernel is enclosed in a pair of scales, called glumes, which help make up the familiar chaff. When wheat is threshed the result is the separation of the grain from the chaff and straw (the stems and dead leaves). Common wheat is an annual plant. Some of its varieties, called winter annuals, are able to live through winters not too cold and finish their growth the second season. During the fall a rosette is formed and from this stems are developed in the spring. Spring or summer wheats do not develop the rosette habit but grow directly in the fruiting state. Winter wheats, with their longer growth period, are apt to be the better yielding. USDA takes a look at the history of wheat consumption in the United States. Also provides per capita wheat flour use per person, helpful for suggestions above. Updated statistics at ChartsBin.com helpful for suggestions above. Originally horse drawn, this machine was used to cut and bind wheat, which was then left in shocks in the field to dry before being threshed. Wheat Harvest on a Real Family Farm in Kansas! A look at a modern wheat harvest. 5-page download at the University of Missouri Extension Center explaining how wheat is harvested. LivingHistoryFarm.org discusses the introduction of the combine. Be sure to view the tractor-towed combine and its many parts and functions. United Nations article for the older student. A 19-page download from the North Dakota Wheat Commission with background information and activities. 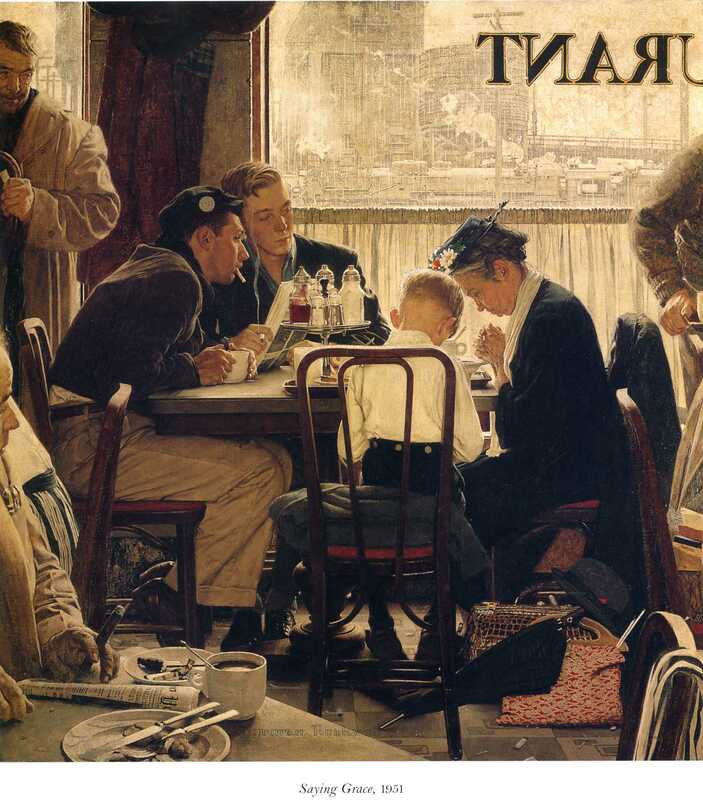 Painting by Norman Rockwell. Use for art study. Does salt affect bread? Experiment from Red Star Yeast. Does sugar affect bread? Another experiment from Red Star Yeast. You can use this interactive timeline generator to create the harvest calendar suggested above. Using the world wheat harvesting calendar in Something to Do #2 above, enter each country who harvests wheat in each month. Let the first label be January. Type in the countries harvesting wheat in that month in the “Description” field. Then continue for the rest of the months in the year. Art activity at DickBlick.com using an unusual material — a loaf of French bread! Chapter from How We Are Fed by James Franklin Chamberlain, a public domain work. Book from The Cambridge Manuals of Science and Literature series covering growing, farming, milling, marketing, and baking. Another public domain work for the older student. Our own book study that covers more than just bread-making! Lesson plan at Oklahoma State University that covers the stages of life for wheat, and the six main parts. Lesson plan at the Utah Education Network that includes research and investigation as student attends Bread Lab 101. Ready to learn to bake bread? Lessons at TheFreshLoaf.com — complete with homework. Part of our free science series based on the book Great Inventors and Their Inventions, includes many activities, downloads, and printables. To help chart the life of bread from wheat seed to loaf as suggested above. How much bread do you eat each week? Chart for notebook at TeachingIdeas.co.uk. 2-page printout at the North Dakota Wheat Commission of the anatomy of a wheat kernel, and a flowchart of how flour is milled. Perfect for notebook! Fun notebooking page at EduPlace.com for younger students. Simple pages to go with the lesson for copywork, narrations, and Something to Do #4.